Desks provided offer a working space that is 48" wide x 30" tall x 24" deep. There are 2 medium drawers and 1 large drawer. 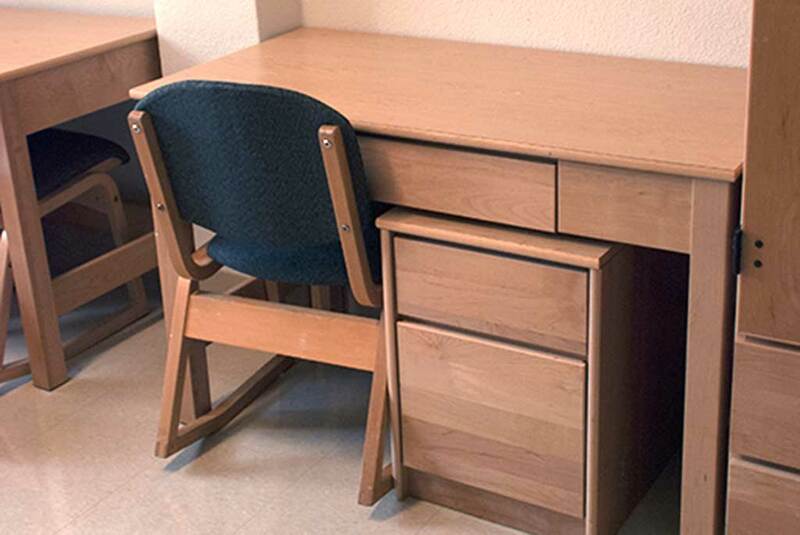 The desks are movable and each furnished with a chair. Each student is provided with their own wardrobe for storage of clothing as needed. Wardrobes are 74" tall x 29" x 24". There are 2 drawers at the bottom for additional storage. 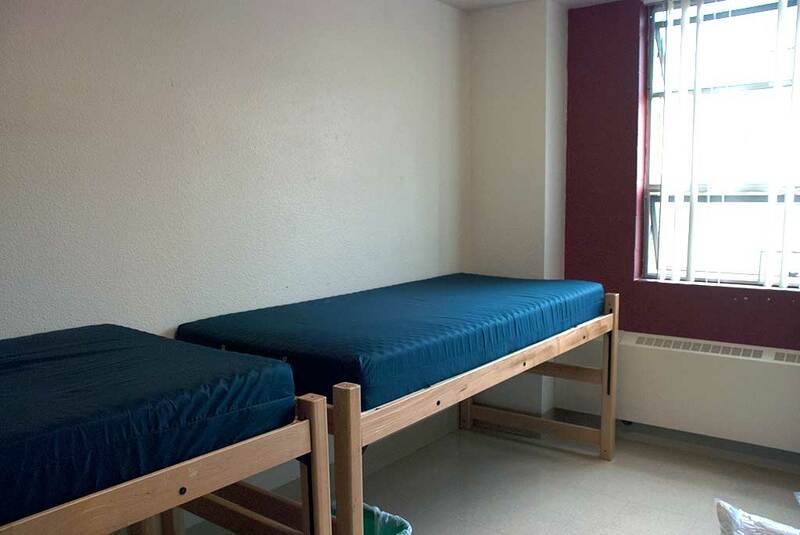 The beds provided in Tebeau Hall are movable and stackable. The dimensions of the bed are 84" long by 39" by 37" inches. With an additional loft kit, the beds can be adjusted to have additional height. The mattresses are extra-long twin. Desks provided offer a working space that is 42" wide x 30" tall x 24" deep with a rear flap that increases the depth to 32". There is a total clearance under the desk of 26". 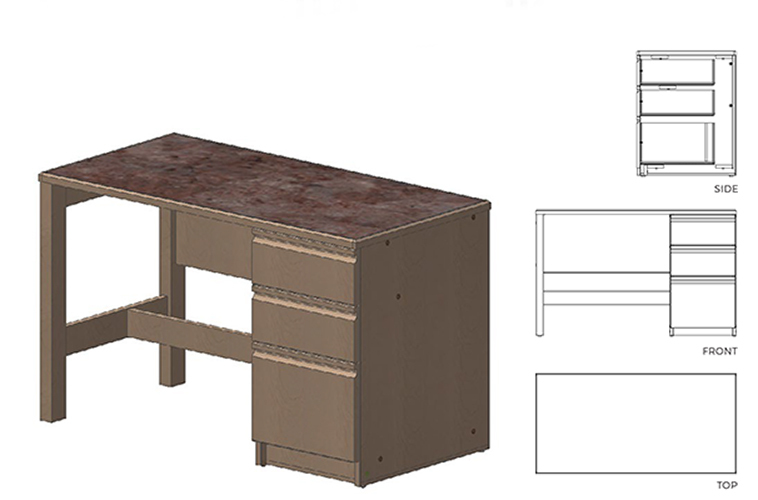 There are 2 medium drawers, 1 large drawer, and 1 pencil drawer directly under the desktop. The desks are movable and each furnished with a chair. Each student is provided with their own wardrobe for storage of clothing as needed. Wardrobes are 84" tall x 36" x 24". The interior section of the wardrobe is 62" tall and includes an adjustable bottom shelf and a bar for hanging clothes 2" from the top. There are 2 drawers at the bottom for additional storage. The beds provided in these halls are movable and stackable. They can be adjusted to have a clearance underneath of 27.5", 21.5", or 8.5". With an additional loft kit, the beds can be adjusted to have a clearance of 69" or 58.5". The mattresses are extra-long twin. Desks provided offer a working area that is 41" wide x 24" deep and has a total clearance underneath the desk of 24.5". There are 2 medium drawers, 1 large drawer, and 1 pencil drawer that is located directly under the desktop. There are two portions in each wardrobe. The lower portion is 26" deep x 40.5" wide x 68.5" tall. The upper portion is 26" deep x 40.5" wide x 20.5" tall. 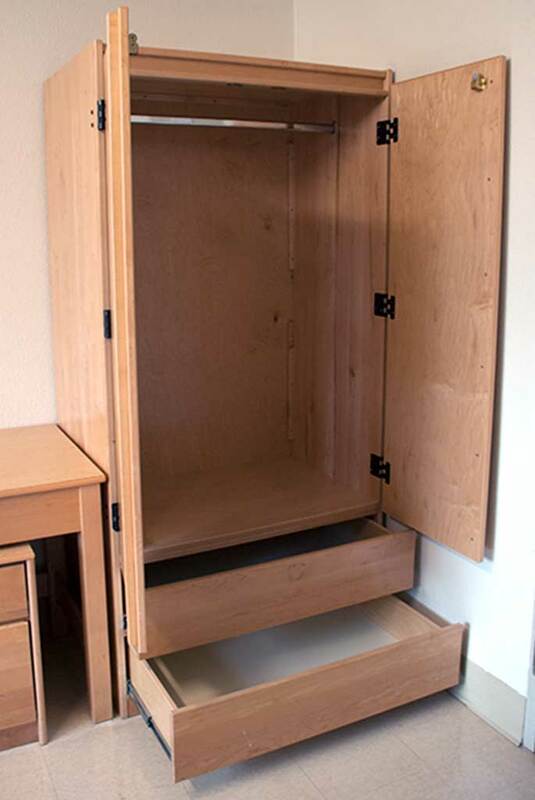 The students are provided with a movable dresser in the wardrobe that has 4 drawers and is 19" deep x 19" wide x 33" tall. Desks offer a work area that is 38" wide x 26.5" deep and has a total clearance underneath the desk of 28". There is a shelf that rests 12" above each desk and is 10"deep. Each desk also has 3 drawers that are 18" deep and 16" wide. There are two portions in each wardrobes. The lower portion is 26" deep x 40.5" wide x 68.5" tall. The upper portion is 26" deep x 40.5" wide x 20.5" tall. The students are provided with a movable dresser in the closet that has 5 drawers and is 15" deep x 15" wide x 30" tall. Each of the beds are a metal frame with a total clearance of 10" from the floor. They are movable and can accommodate two bed raisers. Beds include an extra-long twin mattress. Desks offer a work area that is 48" wide x 24" deep x 30' tall. The desk the also has three drawers. Rooms on Finley Floors 2-3 have free-standing wardrobes. Dimensions of wardrobes vary by room. Desks offer a work area that is 44" wide x 23.5" deep and has a total clearance underneath the desk of 28". There is a shelf that rests 12" above each desk and is 10"deep. These rooms are furnished with stationary wardrobes that are 87" tall x 24" deep x 40.5" wide. Desks in Sackett offer a work area that is 48" wide x 24" deep and has a total clearance underneath the desk of 24". Each desk also has 2 pencil drawers. Sackett Hall provides walk-in closets. Each closet comes with 1 built in dresser, 1 movable dresser, and a bar for hanging clothes. 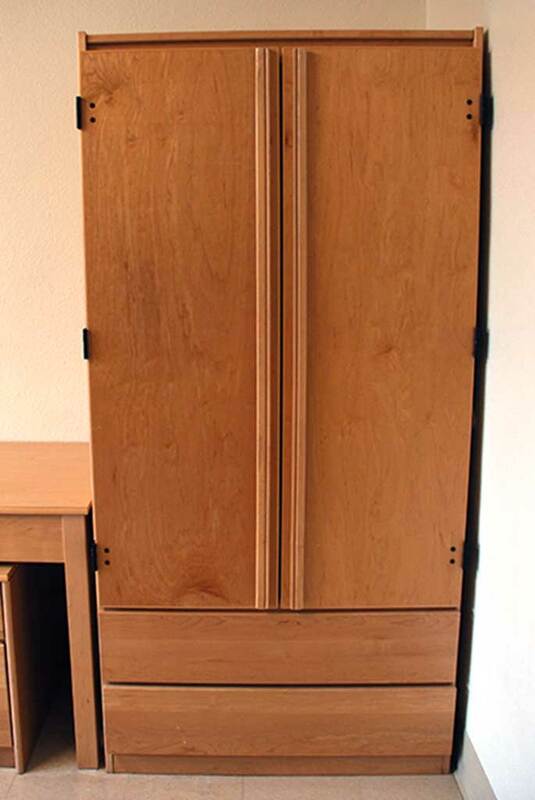 The built in dresser is 48" tall x 30" wide x 20" deep. It has 2 large drawers and 2 small drawers (approximately 11.5" wide), and a cupboard. The movable dresser has 5 drawers and stands 40" tall x 30" wide x 18" deep. There are 2 sizes of clothing bars. One is 36" long and hangs 62" off the ground. The other is 24" long and hangs 72" above ground. The beds provided in Sackett are movable and stackable. They can be adjusted to have a clearance underneath of 27.5", 21.5", or 8.5". With an additional loft kit, the beds can be adjusted to have a clearance of 69" or 58.5". The mattresses are extra-long twin. Bed (Steel, Black Powder Coat, w/Maple Wood Accent, 83"L x 36"W x 38"T). ILLC beds are adjustable up to 36 inches in height without a loft kit. ILLC beds do not accommodate bed risers.